Chrissy let me know about a cool feature available on the latest version of Target’s Cartwheel App. Now you can check whether a Cartwheel offer matches an item before you get up to the checkout lane using the app’s barcode scanner. Cartwheel has made this available on both iPhone and Android smartphones too. 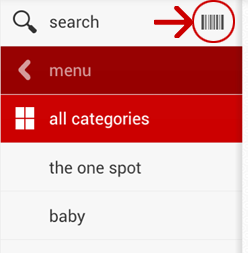 You will need to have the latest update to Cartwheel to use this feature, Version 1.4.1. To find this feature on Cartwheel, just sign in and the main menu will come up. At the top of the screen, you’ll see the search box with a barcode icon to the right. When you’re ready to scan an item, just tap on this icon and then line the camera up with the barcode of the item. If there is a match, Cartwheel will bring up the offer for you to add. 🙂 That’s it! Your smartphone or device must have a camera to use this feature. You can use this feature to scan items as you shop using Target’s FREE WiFi connection. Although my shopping trips are usually very-well planned- I think this is great for last-minute finds at the store and a big help and a time saver in my book! It’s also a way to check for cartwheels on spur of the moment clearance finds. Many cartwheels do exclude clearance- but quite a few do not- so this is an easy way to check! If you do not yet have the Cartwheel App, you can go HERE to download for Android devices and go HERE for the iPhone, iPad and other Apple devices. –Thank you Chrissy for the heads up on this nifty little time saver! Used it yesterday. Saved $8. I’m loving cartwheel. Glad they made it available to non Facebook people. Oh sure enough! I didn’t realize it was there! Amazon has that too. Which is great for comparing prices when you are at a store. I love the scannable bar codes on the shelf tags! Cartwheel is so handy. I have saved $175 using the Cartwheel app!! I use my iPad. Don’t have an iPhone. I am having a heck of a time trying to scan items with it. I have given up. I feel like mr magoo using a microscope trying to get the app to line up with the bar code. Has anyone using an iPad figured this out? dumb question: how do you connect to their wifi? I have a hard time using cartwheel on their website. Sprint has the worst access coverage ever. Have be almost at the entrance to connect to the internet…..
That is AWESOME! I will be trying that out next time I’m at Target! Does any one know how to update to get the latest version of cart wheel? HI Jennifer- iphone or android? I have the 1.8.2.2 version and it does not have the scan option, how do I get it?